The award winning Putnam County Charter School System (PCCSS) serves approximately 2,700 students and is host to a new College and Career Academy. In the 2013-2014 school year, Putnam County High School (PCHS) lead Georgia with dual enrollment in both high school and college courses. PCHS students have the opportunity to participate in Work Based Learning, mentoring, internships, and job shadowing programs. PCHS scored third in SAT scores for the state of Georgia. The 2014 District CCRPI scores were the 11th in Georgia. PCHS also has a graduation rate higher than the state average. Gatewood Schools is an independent, co-educational, college-preparatory school that offers a superior educational opportunity to qualified students from K3 through twelfth grade. The mission of the school is to prepare students for a successful college experience and a useful, satisfying life; promote intellectual curiosity and love of learning through faculty excellence and a rigorous program of studies; help students develop a sense of personal honor, ethical commitment, and civic responsibility, as well as, a vision of academic excellence; support students by creating an atmosphere of trust, mutual respect and responsibility in which each person is valued as an individual; appreciate the background, and encourage the talents and qualities of each individual student; and motivate students to reach their full academic, aesthetic, and spiritual potential. Central Georgia Technical College (CGTC) provides workforce development at the Eatonton campus, as well as at their 10 other locations. CGTC provides a quality academic and technical education, along with customized business and industry training, continuing education and adult education services. CGTC is a nationally accredited institution that offers more than 200 career program opportunities, most with associate degree options. Graduates continue to have 100 percent passing rates on national certification exams and enjoy an impressive 95 percent success rate in placement directly into the workforce. 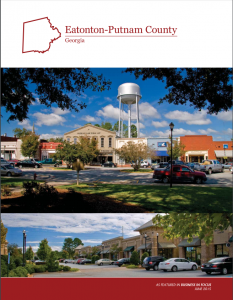 Georgia College & State University and Georgia Military College are only a short 30 minute drive to Milledgeville. Other colleges and universities within a 50-mile radius of Eatonton include the University of Georgia, Mercer University, Wesleyan College, and Middle Georgia State College.